A new puppy, ‘one of a kind’, born just a few days could grow up to be the ideal guard dog, one of the world’s best, according to a dog breeder this week. 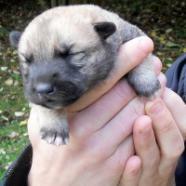 The newborn puppy is female and fits in the palm of the hand. As yet unnamed, this little puppy is light brown in colour and is the first known cross breed of a stud dog Siberian Husky and the mother Belgian Malinois. The new breed is named the ‘Huskinois’.